Atorvastatin, the generic form of Lipitor, can reduce the chances of heart attacks and strokes in people at risk. Side effects, such as muscle pain, are uncommon but should be part of the conversation about starting the medicines, a study concludes. 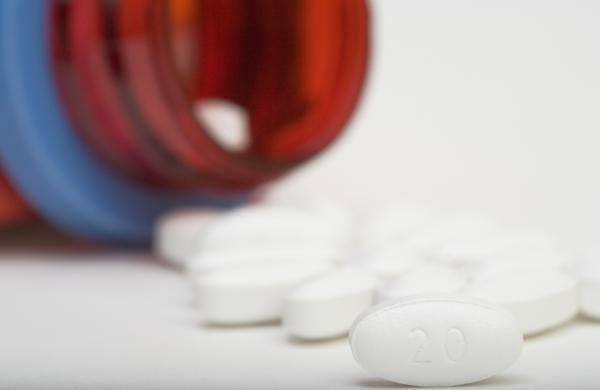 A study published Monday is pushing back against the notion that up to 40 percent of Americans should be taking statin drugs to reduce the risk of heart disease. The study, in the Annals of Internal Medicine, argues that current medical guidelines haven't adequately considered the risks from these widely used drugs. "Some harms are mentioned, but it's entirely unclear how they were considered when coming up with the recommendations," says Milo Puhan, a physician and epidemiologist at the University of Zurich and senior author of the new study. "In our approach we very explicitly considered the harms." It's important to note that statin drugs are generally safe, and harms are uncommon. On the other hand, the benefits aren't that great, either. Anywhere from 50 to 200 healthy people need to take a statin daily to prevent a single heart attack for five years, so even small harms may outweigh the potential benefits, the Swiss scientists say. The most common side effect of these drugs is muscle pain, which usually goes away if patients stop taking the medicines. People taking statins are also at a higher risk of developing diabetes, which is harder to reverse. Puhan also found that some statins were more effective than others, with atorvastatin (the generic name for Lipitor) being the best of the bunch. He notes that physician guidelines don't generally compare the relative value of these drugs, which are all available as inexpensive generics. He also finds that benefits fade compared with harms as people get older. "The elderly do not benefit as much as previous studies might have thought," he says. "One size doesn't fit it all," he concludes. "That's a very important message." Puhan says, based on his assessment, perhaps 15 to 20 percent of older adults should be taking statins – far less than the 30 or 40 percent suggested by current medical guidelines. "I think for me, as a physician," says Ilana Richman, an internist at the Yale School of Medicine, "this kind of data suggests that if we give more weight to the potential for adverse events, then maybe it's reasonable to hold off for lower-risk patients." She co-wrote an editorial about the paper and came away from it thinking that doctors need to spend more time talking about the plusses and minuses of statin treatment, personalizing their recommendations more than they do now. She says it's a challenge to convey these sophisticated concepts in the short amount of time doctors have to spend with their patients. Yet that kind of dialog is increasingly the expectation. In mid-November, the American Heart Association and American College of Cardiology published new guidelines calling for more nuanced conversations around who would most benefit from statins. Scott Grundy, a physician at the University of Texas Southwestern Medical Center who chaired the guidelines committee, says the new recommendations urge people in this gray area to get a special kind of CT scan that looks for calcium deposits in heart arteries, a signal for clogs that could cause trouble. "If you have no coronary calcium, then your chances of having a heart attack over the next 10 years are very low," he says. And it turns out that perhaps 40 percent of people who are identified as candidates based on their risk factors such as cholesterol levels and age actually have clear heart arteries, Grundy says. "That means a lot of people are going to be treated unnecessarily if they don't have the calcium scan." But that test, which Grundy says is available for about $100, is controversial among some physicians. They worry that it will trigger overtreatment of conditions that the scan will pick up, but which don't require urgent attention. And it is only useful as a screening test for people who haven't had heart disease. Statins are routinely prescribed for people who have already had a heart attack or stroke. For those patients (who weren't included in the Swiss analysis), the benefits are so clear "it's almost mandatory to be on a statin drug," Grundy says. He disagrees with a lot of the particulars in the Swiss study. So does cardiologist Roger Blumenthal, who heads the Ciccarone Center for the Prevention of Heart Disease at Johns Hopkins. "The harms [analyzed in the paper] can be dealt with by a smart clinician," he says. Yet both the new guidelines and the latest study agree on an important point: Doctors and patients should spend more time reviewing the benefits and risks of statins, with attention paid to each person's particular circumstances. A study out today pushes back against the notion that up to 40 percent of healthy Americans should be taking statin drugs to reduce the risk of heart disease. The study argues that the guidelines have not adequately considered the risks from these drugs. NPR's Richard Harris reports. RICHARD HARRIS, BYLINE: The risks from these drugs aren't great, but the benefits are also not that great for people who have never had heart disease. To prevent a single heart attack, something like 50 to 200 people need to take statins for five years. To assess the overall value, Milo Puhan, an epidemiologist at the University of Zurich, focused on the potential harms of these widely used drugs. He says those harms get short shrift in guidelines that doctors use to figure out who should be taking statins. MILO PUHAN: Some harms are mentioned, but it's entirely unclear how they were considered when coming up with the recommendation. And in our approach, we very explicitly considered the harms. HARRIS: The most common is muscle pain, which usually goes away if a patient stops taking the drugs. People taking these drugs are also at higher risk of diabetes, which is harder to reverse. Puhan also found that some statins were more effective than others, with atorvastatin being the best of the bunch. PUHAN: Although the benefit-harm profile is known to be better for some than for other statins, this is not really reflected much in the guidelines. HARRIS: His report in The Annals of Internal Medicine also finds that benefits fade compared with harms as people get older. PUHAN: One size doesn't fit it all. I think that's a very important message and that the elderly do not benefit as much as previous studies might have thought. HARRIS: Based on his assessment, Puhan says perhaps 15 to 20 percent of older adults should be taking statins, far less than the 30 or 40 percent suggested by current medical guidelines. Ilana Richman, an internist at the Yale University School of Medicine, co-wrote an editorial about the paper and came away from it thinking that doctors need to spend more time talking about the pluses and minuses of statin treatment, personalizing the recommendations more than they do now. ILANA RICHMAN: I think for me as a physician, this kind of data suggests that if we give more weight to the potential for adverse events, then, yeah, maybe it's reasonable to hold off for lower-risk patients. HARRIS: Do physicians actually have time to have these conversations with their patients? RICHMAN: That's a real challenge. I will absolutely agree that it's challenging and time-consuming, and it involves explaining sophisticated concepts in a short period of time. HARRIS: Yet that is increasingly the expectation. Just two weeks ago, the American Heart Association issued new guidelines calling for more nuanced conversations around who would benefit from statins. Scott Grundy, who chaired the guideline committee, says the new recommendations suggest people in the moderate-risk gray area should get a heart CT scan called a calcium scan. SCOTT GRUNDY: If you have no coronary calcium, then your chance of having a heart attack over the next 10 years are very low. HARRIS: And it turns out many people who look like they might need statins actually don't when you look at the calcium in their heart arteries. GRUNDY: That means a lot of people are going to be treated unnecessarily if they don't have the calcium scan. HARRIS: But Grundy says that test is only a sensible screening tool for people who are healthy. GRUNDY: And if you have had a heart attack or stroke, it's almost mandatory to be on a statin drug. HARRIS: Grundy, at the University of Texas Southwestern Medical Center, disagrees with a lot of the particulars of the Swiss study, but both reports come to the same broad conclusion - doctors and patients should spend more time reviewing each person's needs when it comes to a statin prescription that could be taken for life. Richard Harris, NPR News. (SOUNDBITE OF DRAKE'S "PASSIONFRUIT") Transcript provided by NPR, Copyright NPR.